Visiting Venice, and want to bring home a beautiful piece of Venetian glass? Then read my experience of buying a unique chandelier handmade on the island of Murano. Every time my sweetie and I visit Italy, we try to find something unique to buy for our home, something special to remember the trip by. For our second vacation to Venice last year, we both had it in our heads to find the perfect Venetian glass chandelier made on Murano. Murano is an island in the Venetian lagoon which has been known for its glass artistry for centuries, and fine work from the island can be found throughout Venice, the Veneto and the lagoon islands. But would we be able to find the perfect Murano glass chandelier for our home, and could we afford it? What about getting it shipped home and installed? These were all questions we were uncertain about, until we came across Simone Cenedese's studio and furnace on Murano. There we were able to find the perfect chandelier for our home, knowing we were getting authentic, traditionally prepared Venetian glass direct from a master artist's studio. Several months later and we could not be happier with our purchase, now that it is hanging in our home - a wonderful reminder every day of our adventures in Italy. Here I'll share our story of how we found the glass chandelier of our dreams and had it installed in our Southern New Jersey home. Glass art on display, on the island of Murano. 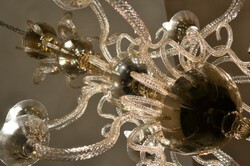 A chandelier was in our minds even before our plane landed at Marco Polo airport in Venice. We knew this was a serious investment to consider for the house, so finding a design that we both liked, and that we knew for sure was made by a reputable local artist, was crucial. During our first few days in Venice, we visited several glass and antique stores in Venice proper to see what they had to offer. There is a common point of knowledge that often you can find Murano glass cheaper in Venice than on Murano--but wherever you shop, you have to be careful about cheap imported fake Venetian glass. We saw a few nice pieces in our travels, but nothing that screamed out to us as "the piece" for our home. On one of our early days during our trip, we took our first trip to Murano for the day. Unfortunately it was a weekend so most of the furnaces were closes, and even some of the showrooms we wanted to browse through. A few large ones were open and had attractive chandeliers, but they were all extremely expensive and I just wasn't sold on making a purchase at the time. I felt we were being pressured to make high end purchases in these shops (even for glass jewelry) and as soon as I showed interest instead in a piece of jewelry under 100 Euros we were blown off and treated like "typical" American tourists instead of serious customers. On that return visit to Murano, we arrived on a weekday just around 11am...perfect timing for the furnace shows and displays where tourists are beckoned in to see the artisans at work. We followed the crowd disembarking from the Vaporetto and ended up in one large open furnace, where a regulated show was being put on for the crowd. It was fascinating, but very tightly and clearly staged. After the show we bought a few trinkets and left, choosing to wander off and see what else we could find. On a side street between the waterfront furnaces and the main glass showrooms along the central canal of Murano, we stumbled upon a quiet and curious studio. Unique glass sculpture filled the courtyard...should we venture inside? Instinct said yes, why not? And a salesperson inside was more than happy to just let us explore and see the wonderful and unique work on display, not at all pushy but extremely welcoming and eager to explain more about the glass art inside. It turned out we had stumbled upon the studio of Simone Cenedese, and we would need to look no further in our quest! Outside Simone Cenedese's studio and gallery on Murano. Simone Cenedese's father Giovanni was born into a family of glassmakers on Murano...and as is often tradition in Italy, son followed in his ancestor's footsteps. In the 1970s Giovanini opened his own furnace, wishing to combine ancient tradition with modern technology and know-how. His son Simone was born on Murano in 1973, and learned from his father the secrets of Venetian glass blowing and art. His unique passion, creativity and artistic vision has lead him to become one of the most in-demand artists working in glass on Murano today, and his work can be viewed in collections all around the world. We didn't know any of this walking in to his factory and showroom, but it didn't take long to realize we were seeing true artistry at work! After viewing smaller pieces in one showroom, we were asked if we wanted to see more elsewhere. Absolutely! Although the small pieces were beautiful, they weren't exactly what we were looking for. The next room, however, was filled with chandeliers and lighted glass pieces! Some were ultra-modern in style, while others blended traditional Venetian styles with a more modern touch. My sweetie David and I both were drawn to one piece almost instantaneously. It had the classical look he loved, with a whimsical unique and modern sensibility that appealed to me. We weren't sure we wanted to ask "how much" at first, but when we did we were honestly surprised by the price. No, it wasn't cheap, but it was actually less than what we had been quoted elsewhere, and not directly on a factory floor. The price would also include shipping and insurance, and we would only need to put down a portion in order to have our order placed and for work to begin on the piece. We debated for a while, looked at a similar but slightly larger design, wondered if we should think on it and return later. But I think we both just had the feeling this was the right one for us. It would be a considerable investment for our home, but something that would be an absolute treasure to enjoy for the rest of our lives. We decided to go for it, and the next step was deciding on specifics of glass color, style, and size of the piece. We mulled over different possibilities for a time and decided that the showroom model would actually match perfectly with our wall colors at home - and if it didn't, we'd rather repaint the walls than pick a chandelier color that wouldn't work! Before finalizing the order and paperwork, we were also able to take a tour of Simone's factory floor and assembly facilities. This was wonderful as Simone himself was there and working on an order, and we were able to watch him at work for some time - David even got a photograph with him when he finally could take a break from his work. We then were shown how the glass pieces were polished and finished after coming out of the furnace in one room; then how the metal and electrical pieces were assembled and tested in another; finally a shipping preparation room where all orders were packaged for shipment around the world on a regular basis. All of this openness and professionalism really convinced us that we were definitely making the right choice with our purchase. Here you can see some wonderful examples of Simone Cenedese's glass work, while taking a video tour of the artist's studio...and the island of Murano. You can also see how clients are able to shop for and pick the exact colors, styles and other specifics of their pieces in the display showroom - just like we did! It was actually less than two months before we received email (and phone) notification that our chandelier was finished and ready for shipment. We paid the balance due by bank wire and very soon thereafter had three very, VERY large boxes delivered to our door! We actually waited a few weeks before unpacking them as I was trying to make arrangements with my general contractor to have the chandelier installed when he had the time for it. We ended up planning on it before Christmas time. Unfortunately I waited until the night before installation was scheduled to unpack and check all the pieces...and it turned out one of the lower glass "arms" had been broken in shipment (but only one, and out of a LOT of pieces that didn't seem too bad.) I did immediately take a photo and send email/fax notice to our salesperson on Murano, who had promised that any broken pieces would be replaced for us at no charge (and they were true to their word; we received a perfect condition replacement within a few weeks' time). Nevertheless it appeared we could go ahead with the main installation of the piece even with the one missing arm; only the bottom "bowl" would need to be removed in order to plug in and place the arm when later received. That said, the installation was a full day - and incredibly nerve-wracking - experience! (Even for me, and I didn't have to do anything but watch my contractor and his electrician from the floor.) The chandelier was to be installed in our front foyer, where the ceiling is about 20-plus feet high. So they had to rent a scaffolding for the day in order to reach the ceiling...and then partially disassemble the scaffolding as they worked, in order to remove pieces of it without possibly damaging the glass. I don't know how they did it, but they did it. Now that it's in place, we can enjoy this work of art in our own home every day. After our wonderful experience, I absolutely recommend Simone Cenedese's incredible studio and factory, should you ever be on Murano and looking for exceptional quality, artistic Venetian glass. We were satisfied with every step of the purchasing process, from the initial welcome by the sales staff through to the final customer service and delivery of our product. When buying a higher end piece of art or design for your home, it is vital to have that kind of relationship and trust in the producer of the work you are buying. I know that whenever we may make another trip to Venice in the future, we will be sure to want to revisit the Cenedese furnace and factory again and see what new wonderful work is on display. The illustrated history of the venetian glass. If visiting Venice, do not miss the chance to visit the lagoon island of Torcello. Now sparsely populated, the island is actually where settlement of the Venetian lagoon began. One of the most unique islands you can visit when in Venice is the lagoon island of Lazzaretto Nuovo - once a quarantine station to prevent the spread of the plague. @dustytoes - yes, it's definitely a focal point in the house and a story we love to share. And you are right, it's important to carefully shop around on Murano, or anywhere in Venice when you are looking to buy something higher-end to bring home. There are a lot of shops selling goods of questionable origin so we like to look for places where we can observe the artisans actually at work, producing the goods on display. The fact that we could customize our chandelier to the color, size and finish we wanted was really important too—we know it was made "just for us" which makes it extra special. That is one gorgeous chandelier! No wonder you were stressing as they had to climb so high to install it! It looks very fragile, and certainly unique. You were wise to have carefully chosen the artisan to create it. I'm sure it is a focal point in your home and probably a topic of conversation to visitors.